The Roach Fire is estimated at 125 acres with 50% containment. The change in size is due to better mapping yesterday. Firefighters made good progress yesterday and will continue with line building and mop up activities today. It is located in the Old Roach area in the northwest portion of Larimer County, approximately four miles west northwest of Hohnholtz Lake. It is three miles south of the Colorado-Wyoming line. The fire is burning in the Roosevelt National Forest and no structures are currently threatened, with the closest structure six miles away. Seven fire engines are on scene, along with a bulldozer, a water tender and five 20-person crews. A type 3 helicopter, a type 2 helicopter and air attack are on the fire today. Two Single Engine Air Tankers (SEATs) are available if needed. Approximately 130 people are working on the fire. There is good access in the area. Forest Service Road 203 is closed and there is heavy firefighting traffic in the area. Visitors are asked to be cautious, especially with the upcoming holiday weekend. The cause of the fire is under investigation. It is burning in lodgepole pine in a mountain pine beetle hit area, with 50-70% mortality. Residents in the High Park Fire area must purchase flood insurance by midnight on August 28 to be eligible for the exception of the 30-day wait period normally required for new flood insurance policies. Contact your home insurance agent for information on purchasing a flood insurance policy today. 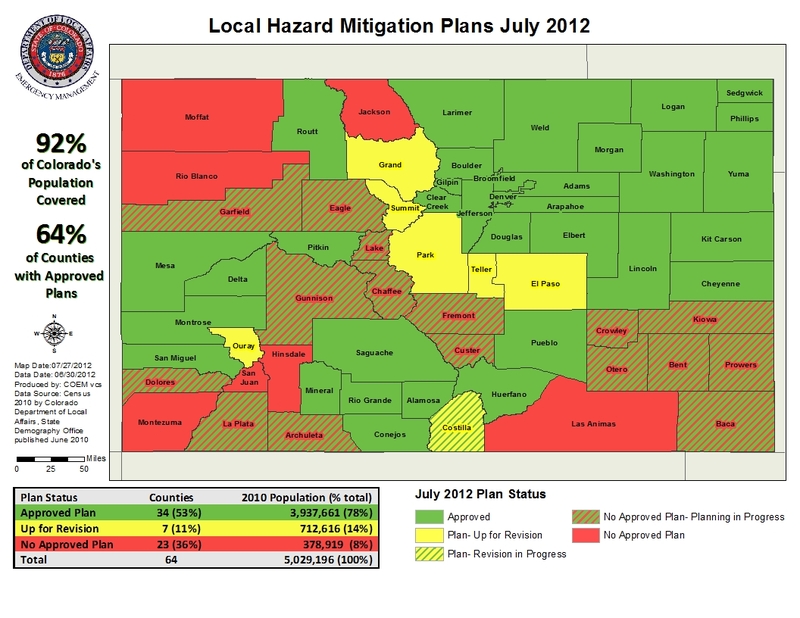 The Federal Emergency Management Agency has announced that Teller County has now been added to the June 28, 2012 presidential major disaster declaration for the Colorado fires. President Obama declared the Waldo Canyon fire in El Paso County and the High Park fire in Larimer County a major disaster June 28, 2012. At that time, reimbursement for eligible, disaster related emergency protective measures and disaster unemployment assistance and crisis counseling were approved for those burn areas. The State of Colorado's Department of Homeland Security and Emergency Management and FEMA is contacting Teller County government entities and certain non profits about procedures to qualify for this assistance. The assistance is provided under FEMA’s Public Assistance Program. This program can provide grants to local governments, state agencies and certain non profits for eligible, disaster related expenses. Additional Public Assistance Program determinations are under consideration. FEMA pays no less than 75 percent of the eligible costs. The non federal share is made up of local resources. The state administers the program. 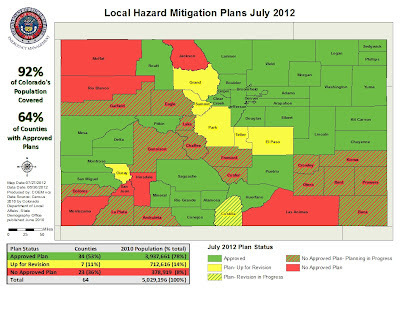 Colorado counties with a current and adopted local hazard mitigation plan are eligible for the Hazard Mitigation Grant Program. Welcome to the Colorado Office of Emergency Management's (OEM) official page where you will find the most recent news stories, videos, photos, podcasts and content distributed by the OEM. We do not allow promotional postings, solicitations, links or advertisements. This includes promotion or endorsement of any financial, commercial, or nonprofit nongovernmental entity or agency. We urge all comments to be original opinions of the poster and we do not allow comments that violate copyrights or registered trademarks or are unrelated to the topic of a discussion. You participate at your own risk, taking personal responsibility for your comments, your username and any information provided. Also, the appearance of external links on this site does not constitute endorsement on behalf of OEM. Contact Micki Trost, Division of Homeland Security and Emergency Management Public Information Officer, at micki.trost@state.co.us with any questions. The Cathedral Fire is located in Rio Blanco County, southeast of Rangely, about 10 miles east of State Highway 139 and 5 miles north of the Piceance State Wildlife Area. It was reported on August 8th and is holding at 40 acres in Pinion, Juniper, grass and brush. Today, there were 5 engines, 3 hand crews and a helicopter fighting this fire. There is one ranch threatened by this fire containing several structures of various sizes. The Puddin Ridge Fire in Garfield County about 15 miles southeast of the Cathedral fire was also reported on August 8th and is 3 acres. It is in grass and brushy vegetation and is being fought by the Pike Hot Shot crew and a helicopter. Both of these fires were caused by lightning and neither have had any injuries. The Wolf Fire is 100% contained and 6,100 acres. The cause of the fire was lightning. The estimated cost of fighting the fire is $525,000. Although many fire restrictions in the area have been reduced or eliminated, fire danger remains high.